Hi friends! It's been one heckuva last 9 months for this runner girl here. I am just under 2 weeks away from my baby's due date, so I expect that any day now (or at some point this month anyway), we'll be welcoming a new tiny human to our household and our lives. If you read my last blog post, you'll know that I'm officially done, for now, with running. I never expected myself to be running right until my delivery date, but I didn't exactly expect that I'd run right up to 37 weeks. I exceeded my expectations of myself, and now I welcome the rest while I await the most exciting journey of my life to begin. I'm very thankful that I was able to run that long, and I wanted to thank you all for reading and supporting me in the journey. I was overwhelmed by the encouragement I received. My next journey will be returning to running post-partum, and then I expect that to be shortly followed up by running with stroller. And who knows - running for achievement of a new personal best could be mixed in there too. There really is a lot about this sport to talk about. Running is a sport that can absolutely be adapted to fit one's lifestyle and stage in life. I am thankful for this because this sport is one that I turn to, day after day, to provide me with my "me time". Running gives me time to be me, sort my thoughts, and receive a endorphin boost, a good calorie burn, a physical challenge, a meditative and grounding experience, that primal connection to the earth and my living body, and empowerment that goes beyond the miles accomplished on the road. I'm grateful that my body allowed me to continue to enjoy these feelings regularly for the last 9 months. Without it, I don't know how I'd feel today. And while I anticipate at least 2 months off from the sport, that time will go by so very quickly. It will certainly be long enough though to make me hungry for my return to it. I see no issue with being motivated to go once life allows it to become a regular part of my day again. Thankfully, my team of doctors in this pregnancy fully endorsed and encouraged me to run throughout pregnancy. And so I did, and it was a great learning experience. I thought I'd take some time to summarize and reflect on this experience and share with you the lessons I learned along the way. Hope you enjoy! Remember one thing - this is not supposed to be easy. The most common theme from talking to others about the experience was about its perceived difficulty. Sometimes the person I spoke to was a woman who ran in her own pregnancy and found it difficult, and she shared her experience with me about how long she kept it up and when/why she eventually stopped. Or those who don't have their own firsthand experience and have suggested that it's unimaginable to run in my "condition" because it doesn't sound easy. 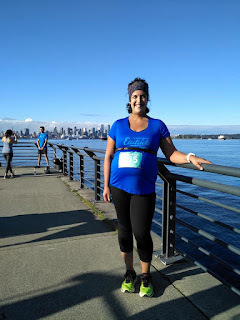 Then there's the opposite sentiment that I've received a few times only -- that because running has been my sport for so many years now, running with the added challenge of pregnancy couldn't have been a big shift for me. I don't know if they thought it was easy on me but maybe they didn't know it was hard. I was simply doing what I'm used to doing but slowing it down, so maybe doing that wasn't hard at all. So I will tell you right now, running is NOT an easy sport. No matter how long you've been doing it or how at times it can absolutely seem effortless, it's not easy. The sport is designed to be uncomfortable and most of us runners don't do it just to do it, be comfy, or to stay the same. We do it to push ourselves to new levels. 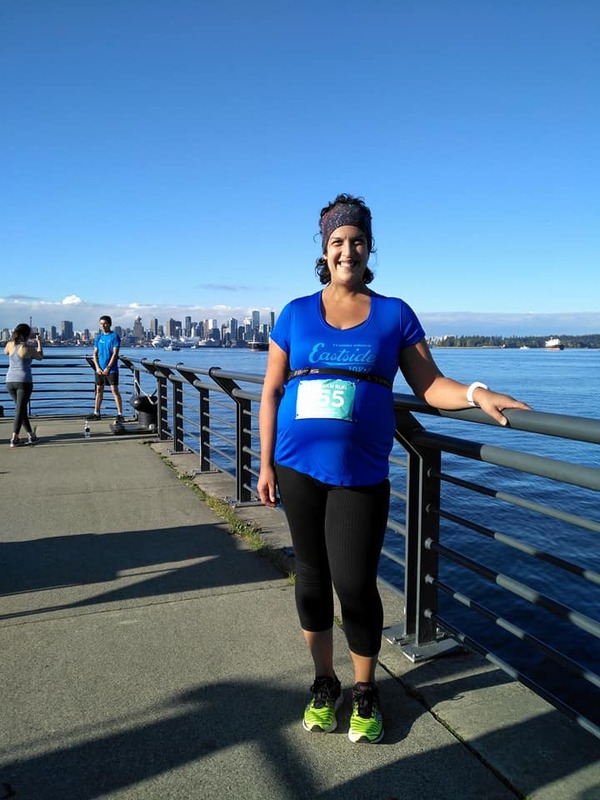 Sure, for me running in pregnancy, my experience of being a runner for a long time helped me through. And I didn't set goals to perform at my races and took it "easy" out here. But running was hard and got harder progressively, week after week as my body changed. Even if I was trying to do "the same thing", the fact that I was changing, maintaining my fitness was an act of pushing myself harder every week. It forced me out of my comfort zone week after week. My mileage lowered progressively, but the effort of putting one foot in front of the other got progressively more difficult every time I went out there. It was discouraging, it was uncomfortable, I was often achy and/or exhausted, I thought of quitting, regularly. It was one of my most difficult running seasons of my life, right up there with returning from challenging injury, or training for my first marathon. There were physical, mental, and emotional challenges day after day, week after week. This included nausea, exhaustion, incontinence, weight gain, achy hips, achy abdominals, achy everything, fear, doubt, self-consciousness, body-image challenges, more exhaustion, a whole lot more weight gain, an altered centre of gravity, circulatory challenges, foot changes, you name it. It was really hard. But that's what made it worth it. Nobody grows when they stay in their comfort zone. Race for you, not for competition. My family doctor warned me against doing races. She said she was cool with me running as long as I wanted, as long as I knew to slow it down when it came to pace and distance. She told me that races could be a bad idea as one tends to push themselves, even if they don't mean to, because they get caught in the energy of others. I took her advice to heart, but lined up for 10 races during my pregnancy anyway. I simply changed my mentality and kept myself cognizant of the dangers of overdoing it at a race. I lined up at the back, started every race slow, took my walk breaks, watched my heartrate, and made sure I had a race plan for every event to ensure I finished in a way that aligned with my current state of fitness. I did not ignore the advice I received, but simply applied the advice to my race approach. I chose to race because even though I run for my own health and for my "me time", my running community is also important to me and I wanted to keep myself connected and engaged in this community. Every race is a chance to connect with other runners, my friends, my running family, and those who are like-minded and see this sport for the amazing thing it is. I can run 5km anytime I want to, but doing so at an event has a whole lot of added benefit that I chose to experience. And I wasn't running to achieve something at my races, I wasn't training to achieve a personal best or a new distance, I was simply lining up to DO the races and to feel great about doing them. Having these races to look forward to gave me a goal to keep my training honest and directed toward. This is huge. In a runner's mindset is the tendency to push no matter what, to run no matter what, even against one's better judgement at times. When you're pregnant, it's not just your own body you have to consider, but the one you're growing. Growing a person isn't an easy task, so we are allowed grace. I was often hard on myself, as I tend to be. But for the most part, I learned that kindness toward myself was the best thing I could do. I paid no attention to pace, I avoided the big hilly routes, I loosened the structure on my training week, and I always gave myself a "get out of jail free" card. That card could be redeemed if I ever needed to end a workout early, skip a workout entirely, or if I decided it was time to hang up my running shoes more long-term. I knew that while exercise would keep me and baby healthy, so would rest, moderation, and kindness. There's no need to be Wonder Woman every day. Set goals and a plan to ensure you don't scrap the goals prematurely. So with the kindness noted above comes the danger of redeeming the "get out of jail free" card when it's not needed. Setting goals, re-evaluating those goals on a regular basis, signing up for races, and having many honest talks with myself kept me on target. I always said I had permission to quit, but the plan was to not quit until I had enough evidence that quitting was the right thing to do. One bad run wasn't enough to say "I'm done". I had plenty bad runs, but they were almost always followed up with an OK run, a good run, or an exceptional energizing run. A good run always feels that much better when on the heels of a bad one. So I always told myself not to quit until I'd seen a true shift that running had moved from possible and OK to truly too difficult to continue. It took until I hit 37 weeks and a full-term baby to feel I was truly ready to stop. Be extraordinary, in your own way. Perhaps this is a mantra I live by always. I don't like keeping myself at status quo. I like to challenge myself to something I know to not be easy and see how I can conquer. I ran through my pregnancy to to prove to myself that I could. If I could do this, certainly I could take on birthing a child. And certainly I can take on the challenges of motherhood. I chose to race because I knew it would feel good and empowering. I had seen other pregnant women at races and thought to myself, "wow that's awesome - I hope I can do that someday". I made sure to try when I had the opportunity, and soon, 10 races were completed. There was nothing extraordinary about my speed, my distance, the races I chose, my achievements at these races or anything I did as a runner this past 9 months. But I feel like my attitude, my perseverance, and my willingness to try something challenging were absolutely extraordinary, and I'm proud of myself. I did all of this for me, but it doesn't hurt when others take notice what you're doing and find inspiration. It's why I blog, share, overshare, and speak openly about my fitness journey. It is why I have done so the last 6 years or so since I started this blog. But most importantly, I know that this ordinary mere mortal of a woman here, me, who's as flawed as the next person, she has grit about her and a desire to better herself, no matter how difficult. And that's one of the many things that make me extraordinary. The event was put on by my friend Kirill, the mastermind behind the West Van Run and whose commitment to creating a true running community is admirable. He has made a genuine impact on the North Shore (and beyond). I wanted to support him, first and foremost. The other two events that Kirill directs, the West Van Run and the Ambleside Mile, are very well organized events I've enjoyed participating in, so no doubt this would be a great event too. 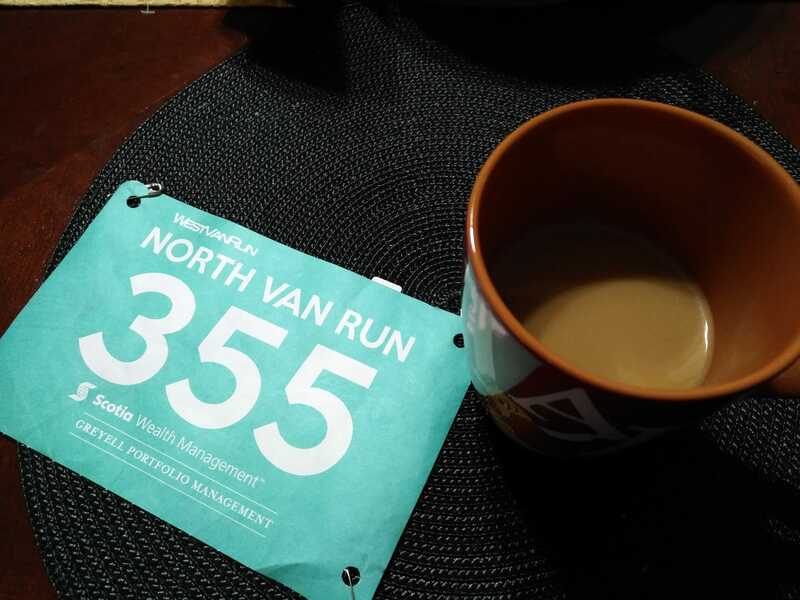 I have lived in North Van since 2009 and have never participated in a running event locally, in my own town. I have always had to travel somewhere to get to the start line. North Van is more known for trail races, which aren't something I've taken to. The only road race I'm aware of is a half marathon that is no longer, that took place the same weekend as another race I was always doing instead. I would be 37 weeks pregnant on race day, and thought it would be a nice way to close my "baby-on-board running season". Related to the previous bullet point, my first race after I learned I was pregnant was the West Van Run that took place in March. So its sister event in North Vancouver made sense to be my 10th and final race for this journey. As with the Eastside 10K race, I opted for a rather last minute race entry. Not that I thought I was going to give birth early, but it was certainly a possibility. It was more that my running slowly progressed to less and less frequent. Perhaps I should say, my running has "regressed" over the past few weeks. I simply didn't want to commit to overdoing it until I felt confident that doing it wasn't overdoing it. Walking the entire race was certainly always a possibility. But you know me, I'm a runner, and I want to run my events, even if I have to take extended walk breaks. With a couple days to spare before race day, I was informed that there were only a limited number of bibs left. So I registered, having faith that baby would stay put inside me a bit longer. The thing was, I had no idea what my race plan would be. It was a "try to run and see if it feels OK" approach. If it felt fine, I'd continue until I felt like stopping. If it felt bad, I'd switch to walking immediately and walk the whole way. So it was tough to set a goal or make a more definitive plan. But I suppose just showing up and committing to finishing the thing is enough at the stage I was in. But silently, I made a goal to run at least 3 of the 5km and to finish as close to 40min as I could, although I wouldn't be watching the clock closely to check if I was achieving that time goal. The 40min goal was just something to aim for, based on it being a little slower than previous recent efforts, proportionately slower to the amount of time that had passed since those efforts, with a buffer knowing I may walk up to 2km. Same approach was followed at this event as all my runs of recent days - follow my perceived level of exertion, look at the heart rate on my watch and keep it at or under the level I'm comfortable with, but not look at any performance-based stats (pace, elapsed time, etc.). This is for the sanity of my competitive-self, so I don't feel bad or discouraged for being the turtle at the back of the pack. I've been told by many how the fact that I'm there doing is inspiring and badass, which I do now believe. I should not let myself get obsessed with time. I can do that later when I'm not running with a watermelon attached to my body! I started race morning with a bold coffee, cold water and pre-natal vitamins, and some peanut butter on toast. Breakfast of a sleepy pregnant champion! I was all ready to head to the start line early, allowing myself lots of time to get there as I wanted to avoid not being able to get through road closures and having an issue with parking. Also, pregnant ladies have a tendency to need a bathroom regularly, so I wanted to make sure there was plenty of time to wait out a long line for the ladies at the start line. Of course, being that this race was right here in North Van, something had to go wrong for me to foil the plan. After the above social media moment where I photographed my race bib next to my cup of coffee, I promptly forgot to include said bib with the gear I took with me to the race. I drove myself almost all the way to the start line, and then it dawned on me that I left my bib at home. I pulled over, checked my bag and confirmed it was time to U-turn myself around and go home to find my bib waiting for me on the placemat next to my empty coffee cup. Thankfully, home was only 5 minutes away, but again, I was fighting the clock to get to the start line before road closures were in place. It ended up not being an issue, but I arrived with a jolt of "way to go baby brain" rushing around like a headless chicken type of adrenaline! The next dilemma was realizing it was warmer outside than I assumed it would be from looking at weather reports the day before. My confidence that I'd be running more than walking at this stage made me realize I'd be too warm in the long sleeve top I was wearing. I had the shirt in my car I planned to change into post race and decided to change then instead. I managed to get back to my car and change outfits with 2 minutes to spare before race start. Trouble was, the shirt I packed was not what I intended to run in as it's too short to cover my belly support belt, so I was self conscious all run of the fact that this ugly belt was visible for the world to see. I should have brought a different shirt as a backup, but didn't think that through. The most important thing though was that the lighter layer kept me comfy running, and I was likely the only one paying attention to my belt. I started the race at the back of the pack, running well, managing to pass quite a few runners and boosting my confidence in the process. There was a fair chunk of hilly in the middle of the race, a couple uphills and a rather steep downhill after. I find uphill hard on the compressed lungs and downhill hard because of gravity pulling the watermelon down. So I opted to walk most of that section. In total, I think I walked about 1.5km total. I ran the whole last km and again, managed to pass some runners who had passed me when I was taking my walk break. That was good for the ego! 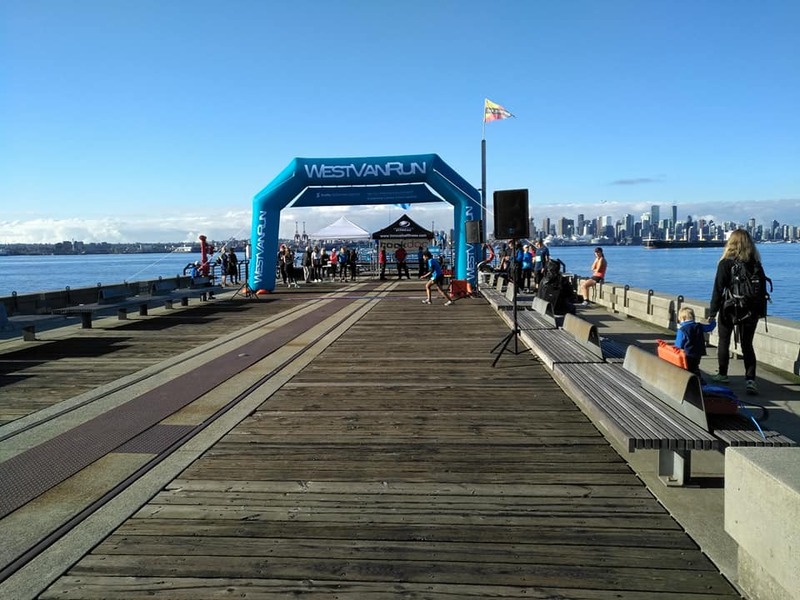 I pushed a little harder at the end, excited to see the beautiful finish line at the end of the Drie Dock on a perfect fall morning, blue sky above and the Vancouver skyline in the background. I came in at 40:30 for my slowest 5km event of my life, but one of the most satisfying! Finish lines don't get much prettier than this! Me and my watermelon at the finish line. It was a good time at the finish line, of course, catching up with other running friends and West Van Run crew members there to cheer and photograph the event. I enjoyed the adrenaline rush of my accomplishment for a little while and then remembered, at 37 weeks pregnant, it was a good idea to get home to a meal, shower, and some rest. I took a race-provided shuttle back to my car, and headed home. After a brief outing after the race, I started to feel very tired, so I went home and changed in my PJs to rest. My belly was achy for a few hours, likely from overtaxed round ligaments that had to hold my belly through the race. I felt fine lying down or walking around, but it was enough to have me realize that maybe it's now time to stop running until after baby. If I could be this sore after running maybe about 3.5km, which isn't far at all, I should switch now to walking. I'm comfortable with that decision. It's time. I don't need to prove anything further to myself. I ran 10 races in my pregnancy, and ran for months longer than I thought I would. I have kept my body and my cardiovascular fitness strong. Transitioning to running after baby will be that much easier because of this. Labour should hopefully be much more tolerable too, because of this. Why make myself uncomfortable by doing this for too long. I'm looking forward to my long walks I'll be doing now going forward. I'm proud of all I accomplished in the 37 weeks of uncertain times. A couple months off from now until doctor clears post-partum exercise will be just fine. It's now only 2.5 weeks until the big due date, and I'm so thankful for my health through this process. Thank YOU for your support and encouragement in this journey.